Climate change & waste management are linked. Here we have a quick and easy guide for you to treat as a beginner’s resource to learning about the connection, its impacts and what you can do to mitigate climate change through better waste management. Start with this general introduction to Solid Waste Management and Climate Change and the debate about various technologies and their role in mitigating climate change. Also read this general overview of how climate change and waste are connected by Thinking About Waste, Mitigating Climate Change. Once you have had an introduction, learn about the biggest impact we can have on mitigating climate change by Changing Lifestyles to Mitigate Climate Change. Learn how our upstream carbon footprint can be reduced by managing food waste by Untangling Behavioral Drivers Behind Food Waste. Know more about a problematic source of green house gas emissions, which damage public health and worsen climate change. Learn about the so-called short-lived climate pollutants and their impact on both climate change and public health. Islands are the most vulnerable parts of our planet to climate change. Learn how waste management infrastructure on islands can be planned and protected from the affects of climate change by watching the panel on Waste Management on Islands for Protecting Health & Ecosystems. Food waste disposers are an old technology which are being used in a new way by some U.S. cities to mitigate climate change and manage food waste. You could quickly read up about how food waste disposers can mitigate climate change and reduce costs. We have solutions to climate change. Recycling and waste-to-energy technologies can reduce green house gas emissions from managing waste. Learn about the compatibility between recycling and waste-to-energy to reduce climate change and solve a public health problem — waste. Everyone agrees that waste has to be reduced, reused and recycled. But what should be done after that has been debated for decades. Even though many agree waste-to-energy is a better solution after 3Rs, there is still some disagreement and debate based on valid arguments. See what they are and decide for yourself by reading After 3Rs, recovery energy from waste or landfill?. Is there a specific area of climate change & waste management that you want us to host a panel discussion on? Or, is there any other other panel or article (external to this website) that you think should be linked as part of this guide, do let us know in the comments. If you found our guide useful, please share it on social media. Want to learn about Climate Change & Waste Management? This resource from @bewastewise is a good start. 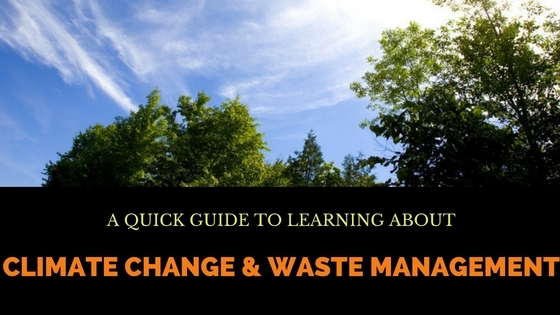 This guide from @bewastewise helps you understand how Climate Change & Waste Management are related.